Getting stuck bumper to bumper in a cloud of exhaust is regular occurrence in China. Not only is it unpleasant, it's taking a toll on the environment. As the world's largest car market continues to grow, the country aims to have more than 500,000 new energy vehicles on the road by 2015 and 5 million by 2020. It began spurring this growth with rebates of up to $9,000 dollars per energy efficient car and started testing electric charging stations in pilot cities from Beijing to Hainan. What will the 200 million cars expected to be on the road at the end of this decade will be running on--Gas? Electricity? A little bit of both? Something else? Every weekend in the quasi-urban wasteland of the Chaobai river outside Beijing, Chinese yuppies congregate to skid their sports utility vehicles around the dry river bed. Members of the Haval car club are discovering the freedom and sense of power that stems from being behind the wheel. This is a lesson that comes to every culture that learns to drive. But the owners are also indulging a peculiarly Chinese sense of individuality, using cars to push the personal boundaries of a conformist society. The liberal use of stickers, decals, furry seat covers, dashboard-mounted perfume canisters and customised slogans makes each Haval – a model produced by Great Wall, a local automaker, and until recently called the Hover – an expression of its owner’s personality. No one at the offroad caper can easily mistake his or her car for anyone else’s. No country on earth has ever bought so many cars in so little time as China. Thirty years ago, 5,000 passenger vehicles were made on the mainland annually; last year, the figure was 11m. That boom is having profound effects, both inside and outside the country: cars are changing Chinese culture and China is changing the global automotive industry. Overseas, Chinese tastes are beginning to shape the cars sold worldwide, as manufacturers increasingly tailor their models to meet the demands of what has become the world’s largest car market. Within China, the birth of a vibrant new culture of the automobile is boosting sales of everything from chrome wheels to prosthetic limbs – inexperienced drivers are prone to gruesome crashes. The hitherto bicycling masses, or at least the richer among them, are buying, financing, servicing, decorating and wrecking cars at a rate not seen since America in the days of the Model T, Japan in the 1960s or Korea in the 1980s. It is very much a car boom with Chinese characteristics – and it is having a profound effect on everything from the economy to the fabric of society. Car clubs capture the paradigm of highly personalised consumption within a crowded culture. Yet the sense of flashback is intense. Haval car club members drink Coke, barbecue meat over portable grills and eat off the tailgates of their 4x4s in an unconscious parody of America, the mother of all car cultures, in its mid-20th century automotive golden age. At the same time, though, they brew Chinese tea and heat up packet noodles on their bit of what passes for the Beijing countryside, only a few hundred metres from the nearest crane and building site. And they make a point of exchanging business cards: for China’s car boom is encouraging not just physical mobility but a new social mobility too. The car club’s head, who goes by the handle Wawa (or “baby”) and comes from the nation’s north-east, is using her car to overcome her status as an outsider to Beijing. A feisty 29-year-old with a one-year-old driving licence, she guns her vehicle up and down a steep slope above the river bank – and masterminds a relief effort when one of the club’s novice drivers inevitably gets mired in sand. Everything from finance to insurance to accident repair is different too. A decade into China’s car boom, about four out of five people who buy cars are doing so for the first time. “Seventy-five per cent of our customers are 35 and younger,” says Kirk Cordill, head of BMW Automotive Finance in China. “We’re really having to explain a loan to customers, and explain why it makes sense.” To serve a customer base with no credit histories, the business sometimes does “home checks” to see whether people live where they say they do – something that would be done in the US, for example, only if a car was on the point of being repossessed. The enthusiasts she meets help to broaden not just her social circle but also the all-important web of relationships that underpin business success in China. Wawa says she meets people from different professions – and different “social levels” – that she could never meet without a car. Apart from making friends and influencing people, club members also get together to spend money on everything to do with cars – from buying the ubiquitous Hello Kitty dashboard ornaments to organising long-distance road trips as far afield as Tibet. Gaps in these industries are huge: hotels, restaurants and other services for long-distance drivers are still rudimentary. Though the Chaobai river park is a well-known tourist destination, it lacks public toilets: the car club has to corral four cars in a square to create a makeshift privy. Plans for an overnight outing have to be shelved, it transpires, because the family hostel the group usually uses has no heating. Car dealers in China will be among the first to benefit, says Ivo Naumann of AlixPartners, a US-based consultancy, in Shanghai. While selling new cars is a low-margin business, he adds, dealers’ profitability will shoot up as those on the road age, boosting demand for higher-margin service and repair work. “In two to three years, China’s car dealers will experience a boom that has never occurred before,” he says. China’s automotive aftermarket is developing more quickly than, and in different ways from, its precursor in the US, says Mark McLarty, chairman of Yanjun Auto, which runs northern China’s largest BMW franchise. “They’re younger – they don’t have the brand loyalty, they don’t have the dealership loyalty,” he says of the country’s car buyers. Mr McLarty installed a glass wall at the dealership to allow customers to watch their vehicle being serviced because, he says, “the Chinese do not trust mechanics”. He built a race track at one Beijing outlet to allow customers to sample the cars’ performance at speeds normally unattainable on the city’s congested roads. In a country where most drivers are new – and accident rates are high – his business also runs its own 24-hour paint and body shop. Tastes in accessories alter over time, says Annie Zhang, sales director for BMW’s Mini brand at Yanjun Auto. Last year, for example, customised headlamps and seat covers were in; this year, she says, stickers are popular, including rabbit-shaped ones to commemorate the Chinese year of the rabbit. “I know someone who paid as much to decorate his car as to buy it in the first place,” she maintains. In a neighbouring garage, Andy Bai, a 21-year-old customer, proudly points to his lovingly accessorised new Volkswagen Golf. Affixed to the bonnet are chrome letters spelling out his name and that of his girlfriend Vera, as well as “Verandy” – a romantic entwining of the two. “I wanted to put the logo on my car so that people will know it’s my car and has my character,” he says. As China’s first generation of drivers ages – and as more Chinese grow up in the back of cars rather than on bicycles – consumption patterns will doubtless change again, possibly in unpredictable ways, analysts say. The government, too, is wary of allowing cars to be put on the road in unsustainable numbers. With a rapidly expanding high-speed rail network, it remains to be seen whether people will rent cars or take trains instead, says Mr Russo. Last year Mercedes-Benz flew groups of 100 Chinese customers to Germany and Los Angeles to offer feedback on the exterior finish and interior features of cars including its S-Class luxury saloon, which hits showrooms in 2013. In particular, they were interested in opinions on the back seat. China is Mercedes’ third-largest market after Germany and the US, but its biggest for the S-Class, the top-of-the-range flagship model. And more than half of the car’s Chinese customers ride behind a driver. As demand for premium cars rockets in China, where there is a preference for the biggest and most expensive models, the country’s customers are determining the look, feel and features of German carmakers’ products, whether sold in Beijing or Berlin. Mercedes’ unit sales in mainland China rose by 115 per cent last year, and 74 per cent last month. The brand’s parent company, Daimler, is building an engine plant in China – the first in its 125-year history to be built outside Germany, and part of a €3bn ($4.3bn) investment in the country. Volkswagen’s Audi marque, after sending members of the design team to California and China to study prospective customers, introduced a climate-controlled cup-holder in its Q5 crossover vehicle. It did this in part because of Chinese consumers’ preference for toting around tea. BMW, the industry’s top-selling luxury producer, generated 39 per cent of its fourth-quarter operating profit of €1.7bn in China, Nomura estimates. Perhaps aptly – given BMW’s appreciative customers and its growing profits in China – the name by which the brand is known in Mandarin, bao ma, means “treasure horse”. Chinese tastes are making the biggest impact on car design in the premium segment, where because of their powerful brands and the relatively small volumes sold, German makers tend to produce models that are almost identical around the world. However, China’s car boom is shaping some mass-market models, too. When General Motors designed Buick’s new LaCrosse saloon, the brand – popular in China – produced a roomy, plush rear-seat space primarily with that market in mind. As China’s weight in world car sales continues to grow, analysts say, it could have a more profound impact, not only on the fit and finish of models but also on the core technology that makes them run. China’s energy and environmental challenges could drive demand for electric cars, analysts say. Conditions on its congested roads will accelerate the industry’s shift from powerful engines to smaller, more efficient ones. 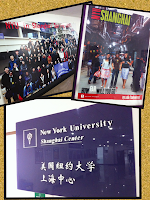 Presentation was delivered by Bill Russo to NYU students on the campus of East China Normal University in Shanghai, China.